THE PEOPLE THAT SPREAD THE LOVE AND MAKE IT ALL HAPPEN!!! We are in need of photographers who can take FREE pictures for the STAND4LOVE campaign for others who are unable to do so. ****IF YOU WOULD LIKE TO VOLUNTEER AS A PHOTOGRAPHER, PLEASE LET RICORACER FLUX KNOW. Our DEEP GRATITUDE and APPRECIATION for all the staff and photographers who volunteered to make the STAND4LOVE campaign happen. We love you all. To ALL Photographers who have a studio or business, we can add you as a sponsor. Just send your logo to RicoRacerFlux@Yahoo.com with a link to your blog or store. To be a Sponsor, We would love your help to spread awareness all over Second Life on our mission to promote love and marriage equality in the world. Any help you can give to promote STAND4LOVE through Second Life Group Notices, Blogs, Facebook, Twitter, Plurk, Flickr and other Social Networking Sites as well as your store fronts are greatly appreciated. We welcome any ideas you may have in promoting this awareness project. It can be a unique outfit or item you’ve made for STAND4Love, a big sale in your store to promote STAND4LOVE, an event/show, an article in your blog/magazine, etc… Anything you want to do would be awesome. In return, we will put you as a sponsor and promote/support your events and business. We do not accept money or donations. We are strictly non-profit. Thank you so much in advance. Please contact Stand4Love Resident (Inworld) or Email Stand4Love27@yahoo.com if you are interested. 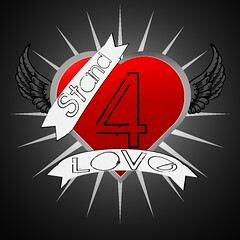 IF ANYONE IS INTERESTED IN BEING A STAND4LOVE STAFF, Please contact RicoRacer Flux or Editorial Clarity. I watched this, I balled. How can people be so cruel? People should be able to love who they love regardless or sexual orientation. Love has no boundaries it is limitless and I support and love my friends and family regardless! Who am I to judge? I’m for wiping out ignorance. This film made me cry and scared me for my own son and his mate/partner & husband someday we hope, It is beyond my comprehension how any parent can treat or react the way those parents did. That is not Love! What those two young men shared WAS Love. It just broke my heart. My son is lucky enough to have his parents and siblings support him and his partner has the same thing ….. Both our family’s Love both of them and support their relationship 100%. We have even drawn up legal papers that if anything happens to us our Son is to have legal guardianship of you youngest son because he is the most responsible and since our youngest is also gay-Bi he will have a mentor who not only will support him but understand any problems or rough road from others he may find in life. Also he will have a good example of what a loving supportive relationship, besides his mom and dad’s, looks like and should be like.